This past week saw the now-imminent French Presidential election campaign reach a fever pitch as independent candidate Emmanuel Macron battles it out against far-right nationalist and anti-EU leader Marine Le Pen for the future of both France and the European Union. Though polls still show Macron defeating Le Pen in this Sunday's final-round election, they continue to tighten and shift as momentum is clearly with Le Pen's campaign. Across the English Channel, British Prime Minister Theresa May was accused of “living in another galaxy” by European Commissioner Jean-Claude Juncker as early Brexit negotiating positions between the two sides are already incompatible. The 27 EU nations laid out their positions for the talks which May has already rejected by her insistence on a dual-track exit negotiation and Free Trade pact process. The ongoing struggle between the world's largest economic block and world's fifth largest economy promises to be fascinating and crucial to watch. Over in the United States, President Trump reiterated his determination to tear up the long standing NAFTA trade agreement with Canada and Mexico if they will not renegotiate the treaty with him. Trump has called the agreement disadvantageous, unfair to America, and in direct violation of his “America First” agenda. It promises to be yet another exciting week in geopolitical affairs and financial markets as the world struggles to come to grips with the changing world order. Be sure you do not face this new unstable world without gold in your investment and retirement accounts. You need gold as diversification insurance for your portfolios because gold outperforms traditional market classes during market crisis periods. The first week of the French Presidential final round of elections campaigning saw Marine Le Pen and Emmanuel Macron going head to head across the republic as they dueled for the future of not only France but the entire European Union. It has only been a week since France upended the old political order, and polls showed most voters agree that Le Pen had bested her centrist opponent as his final campaign got off to a rocky start. Macron made several blunders right from the start. Though he repeatedly argued he would not make “the same mistakes as Hillary Clinton by moving her furniture into the White House before she won the election,” he proceeded to act as if he had already won the election by holding an expensive restaurant celebration for his staff after he triumphed in only the first round of the race. Le Pen was able to accuse him of being elitist for not only this controversial too-early celebration move, but also for meeting with union leaders at a factory which Whirlpool is closing and moving to Poland. She once again outmaneuvered him by showing up unannounced on the factory grounds to meet with the workers who wildly cheered and greeted her presence with euphoria. When Macron turned up in damage control mode and tried to reason with the same people outside of the factory, he was booed, jeered, and called an elitist banker on national television. This past weekend, Marine addressed an issue that is hurting her with many voters— withdrawing from the euro single currency. In order to pick up a crucial endorsement from the other right wing party, she agreed to revise her position so that there is no urgent rush to leave the euro currency. Le Pen also picked up the leader of the rival party Nicolas Dupont Aignon as her running mate to be her prime minister. His nearly five percent of the first round vote is a significant boost to her campaign and chances for winning the election. “The euro is dead.” I want to have two currencies. One for everyday use of the French population and one for international trade. The key in the election is likely what will happen with the voters of Jean Luc Melenchon, the far-left firebrand candidate still holding on to his 19.2 percent first-round voters. So long as he does not endorse Macron, his voters will just as likely break to fellow anti-EU candidate Le Pen as they will to Macron this coming Sunday, May 7th. A Le Pen win in this French election could change the world as you know it. This past week the 27 EU remaining members formulate their opening Brexit positions at their Brussels Summit regarding red lines on negotiating with the United Kingdom. What the framework positions revealed is that the two sides are already at a standoff that will be difficult if not possible to resolve. Brexit has already begun with threats. May also denied she was living in a “different galaxy” as European Commissioner Juncker accused her of over the past week. She predicted that the upcoming two years of Brexit will be “tough.” Meanwhile her EU counterparts have repeatedly stated that the Prime Minister's expectations on the negotiation proceedings are unrealistic. Despite this, the British and EU sides only have until March 29th of 2019 to come to an agreement on the Brexit. At that point, Great Britain will be outside of the EU with or without a deal. May stated at a European dinner this past week that the United Kingdom does not owe any money as a divorce settlement to the EU. She believes that they can settle the rights of European Union citizens who are living within the U.K. easily and quickly at the June EU summit. How the impasse will be resolved when the EU leaders' priorities are to force a British settlement of financial commitments (to the tune of 60 billion euros), which the British have called a non-starter, is unclear. The other issues about figuring out the new border controls between Ireland and Northern Ireland and guaranteeing EU citizen rights within the United Kingdom are less problematic. EU representative and chief negotiator Michael Barnier repeated the block's common position that until “sufficient progress” has been noted on each of these three topics, they will not turn their attention to the trade agreement. Barnier suggested this will not likely occur until at least the conclusion of this year. The stated end-goal of the EU is to demonstrate (to other would-be defectors) how difficult it is to leave the common market block in such a way that Britain will meet all of the Union's perceived obligations. They are attempting to hold the U.K. hostage with the carrot and stick approach to the much-desired and so-far elusive trade deal. President Trump had just signed his latest executive order on Saturday which orders the U.S. trade representative and Commerce Department to study all of the U.S. trade agreements. They will decide which trading partners are fairly treating America and whether or not the World Trade Organization and its 164 member states are providing America with a fair trading arrangement. 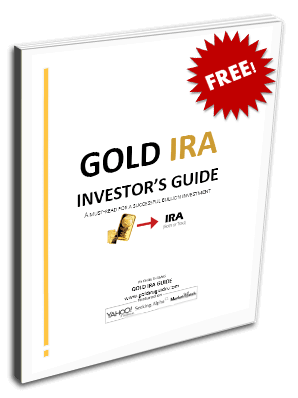 Owning physical gold through an IRA will protect your retirement portfolio from the geopolitical instability gripping the world almost every week anymore. This week's key news provides you with all of the reasons you need to remind you that gold makes sense in an IRA.